"People were coming into my office, phone calls were flooding in, e-mails were coming in, 'I just sent money to Obama, I couldn't sleep last night' - from the left. To see this cocky wacko up there," he said. Chafee, whose father served as senator from Rhode Island from 1976 until his death in 1999, narrowly lost his re-election bid two years ago to Democrat Sheldon Whitehouse amid that election cycle’s wave of anti-Republican sentiment. Chafee made a stir earlier this year when he directly called out Democrats who supported the Iraq war and were now expressing regret for their vote. “I find it surprising now, in 2008, how many Democrats are running for president after shirking their constitutional duty to check and balance this president,” he wrote in his January 2008 book, “Against the Tide.” “Being wrong about sending Americans to kill and be killed, maim and be maimed, is not like making a punctuation mistake in a highway bill." How does a former Rhode Island Senator (who is not in office during Palin's term as govenor Alaska) know her. Has he even had meet, conversed or even had an email from her?? Cocky Wacko?? FORMER Senator Chafee... your 15 minutes are up!!! I will do the ballon stunt.......with Sarah! Yeah, well Chafee is a nity nity poo poo. She thinks the world is going to end in 20 years anyways. Thats her religious belief. So she doesnt care about our nature, our world, our home. All she cares about is use up what the world has NOW. Goodbye America.... We are going to fall because of Mccain and Palin. Chaffee is a left wing pacifist. His demeaner is absolutely frightening when you listen to him speak. Glad he's gone!! thank you, uh, esteemed former senator chappee.. Thank you Mr. Chafee, nice to see that someone who was a Republican actually speaks his mind. I'll bet there's lots of them out there that just don't want to deal with the grief. But watch out – the Rovian machine is coming to get you next. You'll hear all sorts of nasty remarks and slurs upon your character. You'll probably even have the religious right demanding that someone (anyone! or Senator Obama!) chastise you for your comments about Ms. Palin. Which canidate is talking about organic farming and organic food? Beware this cocky wacko, the libs are scared to death, what a riot to watch them try to destroy her. That cocky wacko is about to kick your butts! 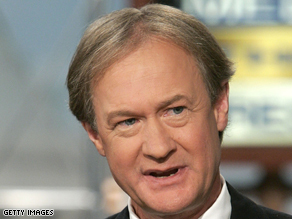 Was there a less acomplished senator than Lincoln Chafee? Oh right, Barak Obama. I hear Sara Palin masks are banned for halloween. All the Democrats would be so scared they would run to the left coast. I've never seen so few (Sara) scare so many (Democrats). Get back to issues. She is far more experienced than obamawama. Way To Go Senator Chafee, Way to Go !! !, But Hillary needs to be alot more active in the campaign. What do you expect from a Northern leftist turncoat? Palin only energized the Republican base (the conservative Christians) They were having such a hard time trying to decide to jump on board with McCain. They have found their saviour. Hmmmmmm, I just wonder who is really the whacko? It seems that many Obama faithful spend their days and hours writing childish comments on line, forgetting that there is a real world out there involving some people who don't even know what a CNN comment is (or care). When Obama messes up the country worse than Jimmy Carter, the Obama fans will have learned their lesson (for some of them a second time!). Less government (and taxes) is always better than more government and more taxes. The do-gooders never seem to realize this until it is too late. Chafee's party–fiscally conservative but pro civil-rights and cautious about international intervention–was taken over by wackoes of the Palin stripe starting in the Reagan years. Her views on creationism, scientific research, Iraq, and many other subjects are so far out as to disqualify her from serious consideration by any except brain-damaged trailer park trash. Unfortunately, there are quite a few of those lurking around, coming out mostly at night when no one will see them. Palin is a hot air ballon. Do I hear Repug....deflation?